For most of us, this weekend is a day of relaxation and 3 days off of work. But for many others, it’s a time set aside to remember someone (possibly) a loved-one who gave their life for their (our) country. Let’s honor those who have fallen and remember their contribution to our freedom. 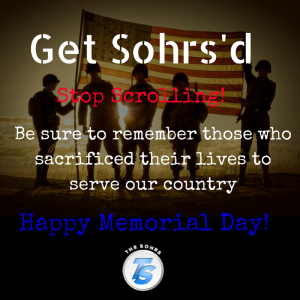 This week’s Get Sohrs’d focus is show some love as we remember those who paid the ultimate sacrifice (their lives) to serve others. Let’s do what Christians do best, be the light that shines in the midst of darkness. Let’s Get Sohrs’d together.